Vergehen was first recorded in 1985 as a demo tape, and re-recorded 20 years later, in 2005. Words and music by Aidan O’Rourke, who played keyboards, guitar, programmed the drums and did the vocals. The lyrics are in German and present a collage of images from the 1920s and 30s, touching on war, totalitarian regimes, the inevitability of downfall and more. The verb ‘vergehen’ means passing away or fading away. In 2018 Aidan moved increasingly into the medium of video, making slide show videos using images from his photography archive, as well as new photos and videoclips. And so ‘Vergehen’ was uploaded to the Explore Learn German YouTube channel on 16th of January 2019. It was the second video to be added to the channel. Like other videos on the channel, ‘Vergehen’ is intended to help and encourage people to learn German. There are some intriguing aspects to the song, which uncannily predicted the future. For those interested in finding out more about this, as well as the meaning of the lyrics and images, Aidan will present a special feature on his Patreon page, for subscribers only! Original 1985 recording made at Cavalier Studios, Stockport. Produced by Lol Cooper. 2005 re-recording made in Vienna, engineered and produced by Rick Turner, with creative input from Isabella Turner. Kraftwerk are a contradiction. They use synthesisers and computers yet their music is full of expressiveness. They deal with complex themes of modernity and technology, yet their lyrics are often slogans or single words, often in multiple languages. On stage the four band members barely tap their feet to the music, and yet their electronic beat is so infectious, it has been the inspiration for dance genres including Hip-Hop, Techno and House. I saw Kraftwerk at the Brighton Centre on 7 June, 2017. I travelled 260 miles from Manchester by Megabus and Southern Railway, and it was well worth the journey. There were queues in front of the hall, which overlooks the sea, and after a long wait while the audience took their seats, the lights went down, the electronic beat started, four men walked onto the stage, each wearing a body suit stamped with a wireframe design. They stood behind four electronic musical instruments, futuristic lecterns, lit up from inside. On a huge screen behind them, shapes, patterns and words danced in 3D. We viewed them through stereoscopic glasses provided on entry. Each band member operated his electronic control centre – or was it a keyboard – gently tapping a foot or pressing a hand on a button or key. The show progressed with dazzling and pulsating beats, patterns and slogans: “Eins zwei drei vier fünf sechs sieben acht.” For people, like me, who understand German, it was great. Kraftwerk make German sound cool. They performed many of their greatest hits, some instrumental, others with words, sung by co-founder Ralf Hütter, who stood on the left. It was clear that he was actually playing the keyboard and singing live. The versions were quite different from the records and had an improvised feel. I loved their live version of Autobahn with its computer-generated images of a VW Beetle and classic Mercedes driving on an imagined motorway in Germany some time in the seventies. Radioaktivität has gained new significance since the seventies. The place names flashed up on screen told their own story: “HIROSHIMA – HARRISBURG – TSCHERNOBYL – SELLAFIELD – FUKUSHIMA”. Each song and its accompanying graphics was an exploration in sound and graphics. Tour de France, Trans Europe Express show Kraftwerk are not just a German but European phenomenon. The time went quickly and sadly the curtains closed. But there was a surprise in store, I won’t say what it is because it would be a spoiler! 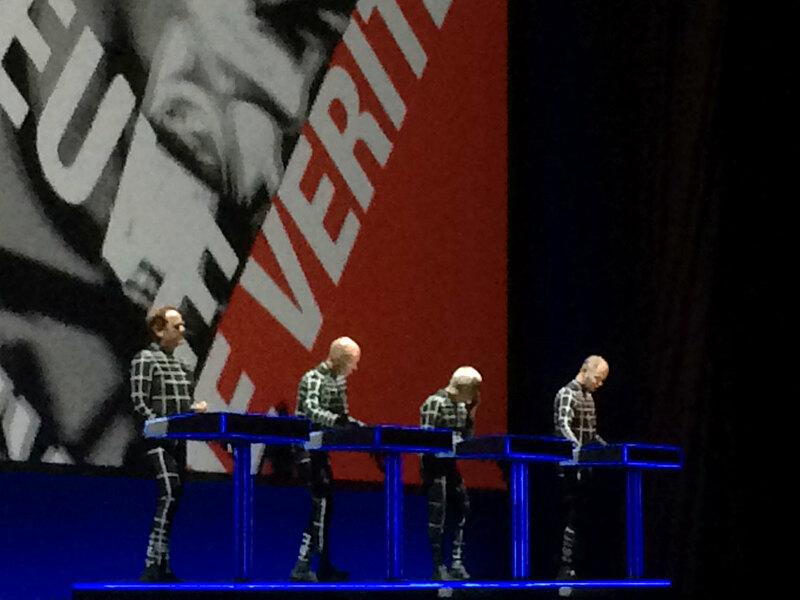 Suffice to say it was intriguing, humorous and typically Kraftwerk! They returned for an encore, and played long, mesmerising tracks with that infectious, groundbreaking electro beat. Abstract waveforms and patterns flashed hypnotically on the screen above. A few people got up and danced at the front enjoying a mini-rave. Finally each member went off separately, taking the final bow. Ralf Hütter was the last to depart, and that was the end of the Kraftwerk concert, an experience I won’t forget for a long time. What’s Stockport famous for? It’s the last stop on the West Coast line from London Euston to Manchester Piccadilly, it’s seven miles south east of the city centre and it’s my home town! But what else is it famous for? Oh yes, it’s the home of a groundbreaking recording studio that existed from 1967 to 1993, Strawberry Studios. So what made Strawberry Studios different? The first thing is that it wasn’t in London. The music industry has been mostly based in London – it still is. But in the mid-sixties, a visionary group of people wanted to set up a studio in the north. The driving force was Peter Tattersall and Eric Stewart. It was named after Eric’s favourite song, Strawberry Field, which was released in 1967. It originally started in another location but moved to an industrial building on Waterloo Road in 1968. Incidentally this is just by the location of the Stockport air disaster of 1967. They wanted to provide a recording facility to match those in London, but close to Manchester. They offered cheaper rates at night so that local bands could afford to record there. They made full use of the latest recording technology. The band 10cc were closely involved in the studios and they recorded many classic songs there, the most famous of which is “I’m Not In Love”, which featured groundbreaking use of tape loops to create rich layered vocals. It was a number one UK hit in 1975 and reached number two in the US. Many other artists recorded at Strawberry, including Paul McCartney, Neil Sedaka, the Bay City Rollers and most notably, Joy Division. Despite the success of I’m Not In Love, 10cc split in 1976, continuing as two separate entities. The studio sadly closed in 1993, but the name survives both as a legend of music and as the name of the building. In the seventies I lived just 10 minutes from Strawberry Studios and though I was active in music in the eighties, I never had any involvement there. The achievements of 10cc and Strawberry Studios are a source of local pride in Stockport and so in the year of the 50th anniversary of the setting up of the studio, it was natural that there should be a commemoration and exhibition. It opened on 27 January, 2017 and though I couldn’t make the opening, I attended in late February. It’s housed in Staircase House in Stockport’s historic Market Place. The house contains exhibits about the history of Stockport on five levels and I can highly recommend it. For me, the high point of my visit was entering the 10cc exhibition in the basement exhibition area. The two adjoining rooms are packed with many fascinating objects, musical instruments, photographs, videos and audio recordings. Eric Stewart’s Gibson ES 335 semi-acoustic guitar is proudly placed in a display cabinet. The guitar was used on all four 10cc albums. The exhibition is packed with lots more artifacts, including 45 rpm discs, badges, amplifiers, music cassettes, brochures, post cards and the original sound equipment used by producer Martin Hannett. I was intrigued to see an original Marshall Time Modulator, and another piece of equipment which had the name ‘Martin Hannett’ inside the case. There was also an example of the ‘gizmo’ a device invented by Kevin Godley and Lol Creme. An electronic copy of the studio bookings diary from 1980 to 1981 contains many famous names. I was overwhelmed by just how many fascinating items of memorabilia have been crammed into such a relatively small space. I found it all fascinating and absorbing. I was lucky enough to meet the curator of the exhibition, music historian Peter Wadsworth. He told me that the exhibition was an extension of his PhD thesis, which is on the subject of Strawberry Studios. For anyone who is interested in the history of music in the Manchester area, this exhibition is a must-see. And if like me, you lived through the Strawberry Studios era, and remember the artists and songs of that time, it will bring back many happy musical memories. I am in Love – runs from 27th January 2017 until 29th January 2018. Stockport Museum is open Tuesday-Saturday 10am-5pm and Sunday 11am-5pm. Entry to the exhibition is free. Stockport Museum is located at 30 Market Place, Stockport, SK1 1ES.